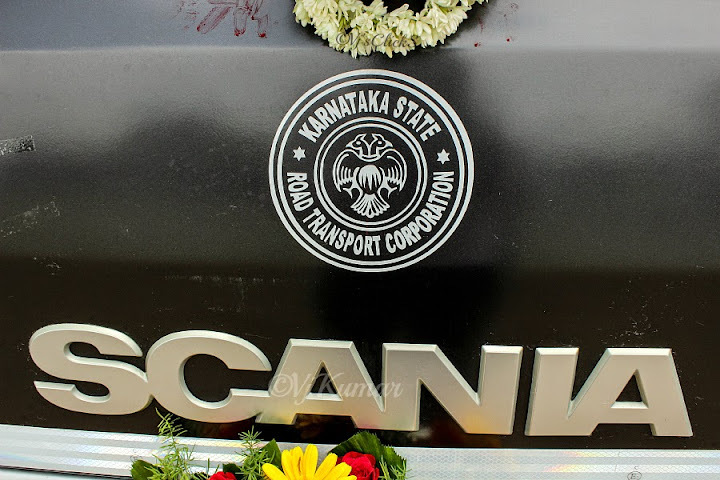 Schumi0101: KSRTC's Scania ride to Bangalore. 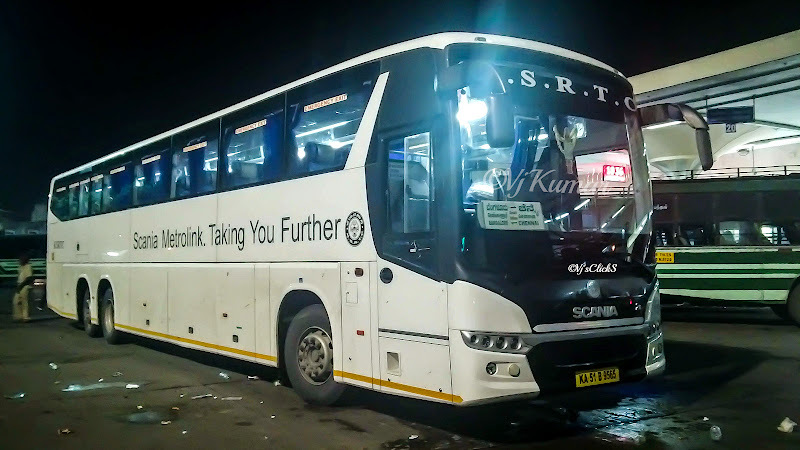 KSRTC's Scania ride to Bangalore. It was almost a month ago on August 3rd when I was enjoying a quiet meal at a restaurant when Mr Yeswanth Kadri (my mentor) called me up asking what my plans for the next day were. I was working as always however he insisted to make up some time and meet him the following day. He said he would let me know about the location on the following morning. Knowing him personally for almost 2yrs now, I knew something big was in store and waited eagerly for day break at work. The phone rang as promised and the location was given. 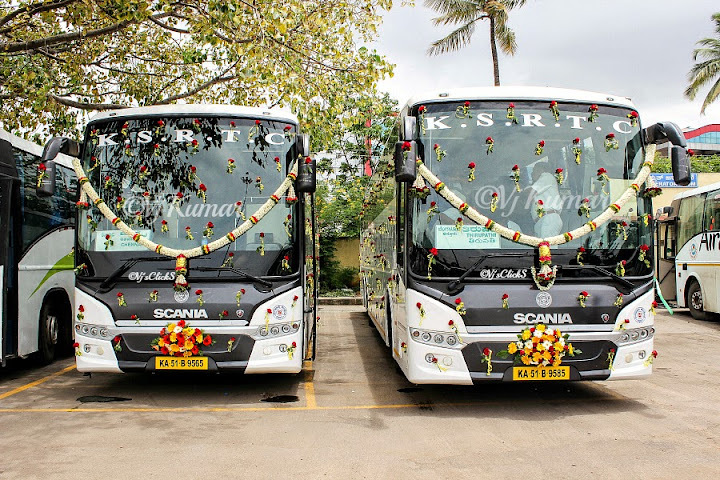 Without further delay I headed straight to the Depot 4 of KSRTC only to find two Swedish beauties decked up like a bride hogging all the limelight. Yes, it was indeed the Scania Metrolink buses which had quietly made their way into KSRTC and was all set to begin trial run. Ever since the launch ceremony, I was eager to try to try their service. Initially the bus ran between Bangalore and Mysore however that was not going to work as I had my hands full with work at office and I had no time at office. Days turned into weeks as I watched the pictures of the buses caught running between Chennai and Tirupati. It was not up until last week when I had my ‘Chennai Calling’ time. I was meeting my family member and was very excited to see him after a year. Though he wanted me to book flight tickets, I was in no mood to miss this opportunity and booked myself a Scania ride back home. Yes, the moment I was eagerly awaiting for had arrived. After bidding a good bye, I skipped my dinner break and headed straight to the CMBT, Koyembedu. The bus was at 11:10pm from Chennai but I was in no mood to make a last minute dash to the bus stand and reached a good 1.5hours early. I spotted many Airavat B7R, Club Class, Superia picking up passengers. Amidst all the chaos stood a beauty graciously under the moon grabbing the attention of the onlookers. While some looked at her puzzled others wanted to know if tickets were available for this service. Few wanted to know about its features and the timings for the departure. The crew had their task cut out trying to answer the queries. Apart from the crew was a technical assistant from Scania who was onboard the bus. I had booked my seat no 1 and boarded the bus and requested the crew to allow me as I was carrying a heavy back. The friendly crew obliged. I spoke to the crew about the service and they said the bus is very promising and it’s a pleasure to drive. Due to high security at the Bus stand, I decided to click few pictures of the bus from my cellphone as I did not want to risk any attention of the cops. I got down the bus and as I was about the click the pics, few cops made their way near the bus. While I stood there waiting for my questioning session to begin, But then they slowly made their way towards the bus, smiled and requested the driver to let them inside. Close call I must say. After a tedious wait, It was time to enter the platform. Most of the passengers who had booked their tickets had boarded the bus. We entered the platform and waited for few more to turn up. Considering it was a weekday, the bus was running 60% full. On our right side was a Superia which left as soon as we entered the platform leaving behind a battered Mysore- Chennai B7R and a Airavat Club Class Mercedes) After a couple of minutes the Mercedes departed and finally it was our time to depart. We pulled out of bus stand at 23:30hrs and headed out of Koyembedu. Though this was my third ride in a Scania, this was my first ever in Namma KSRTC and the excitement had touched its peak. The conductor handed out water bottles and blankets. Then came the feedback form which had clauses about the Bus, its features, crew behavior, driving, time management and so on. I got to work immediately giving them good grades and then came the most interesting column, time management. I gave them satisfactory and added a note to pull up their timings on their premium route. Also one reason y I marked them was the fact that I knew that this journey would take a little more than anticipated. Well, KSRTC had a surprise for me. The a/c was set to optimum as the bus sailed through the traffic. After a couple of minutes into the journey, my eyes were battling sleep but I tried my best to stay awake. In the distance was the Superia which had left almost 30minutes ago. I was not sure what delayed him. Finally I gave up and closed my eyes. The noise inside the bus was bare minimum and it was more than enough to put me to sleep. The last thing I said to myself before closing my eyes was get a power nap, wake up and join the driver up ahead to enjoy my journey. I vaguely remembered passing the toll near Sriperumbudur. I was deep in slumber without any clue about my whereabouts when the lights in the bus came on and the driver shouted out Krishnagiri..!!! I woke up startled and looked at my clock and it said 4:00am. It took me sometime to realize the time taken to cover the distance; however I sank into my comfortable seat to continue my sleep. It was around 5am when the diver started playing devotional songs on the FM and I opened my eyes with great difficulty to see the bus had reached Electronic City. The driver took the road beneath the flyover and dropped few passengers at Bommanahalli and at Silk Board. The bus zipped passed the empty streets of Bangalore and in no time reached Shantinagar Bus Stand at 5:20am. It took me some time to realize that we covered over 350kms in less than 6hrs.While others began to get down, I grabbed the feedback form, scratched the ‘satisfactory’ option for Time Management and marked ‘Good’. With that my journey with KSRTC’s Scania was over. There are all kinds of talk about KSRTC acquiring Scania buses after the trial period. I am not sure if that is true but if they do so, it will be yet another smart move from KSRTC. The bus is very comfortable and with the mileage figures that I heard from the crew, it sure looks like a winner. The service is highly recommended and why wouldn’t I do so when you have courteous crew who are driving behind the wheels ensuring the safety of passengers on each passing mile. Good review Schumi0101. I always considered travelling in private travels over KSRTC. This helped me to review my opinion about KSRTC. I excited to know about the mileage. Let me know the mileage. Thanks a ton for your review. How to book tickets on this scania bus? great blog schumi!! pleasure reading it.